V Rev Manchester is the city centre’s first and only 100% vegan eatery, established in 2011. Situated on Edge Street in the Northern Quarter of Manchester, V Rev Manchester was founded by Dominic Moss and his friend Chris Redman five years ago as a vegan grocery and record store. Due to the popularity of his menu, Dom moved premises to the much larger, purpose built one, on Edge Street and began serving purely food. 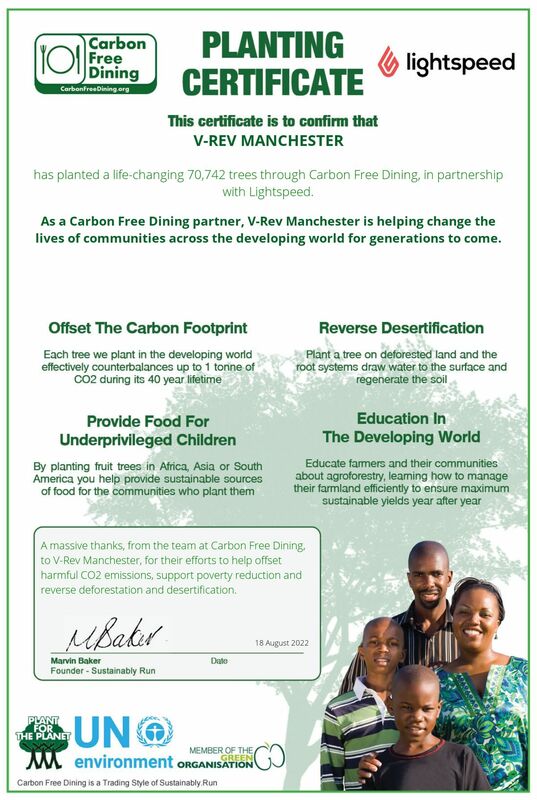 Now, not only does V Rev Manchester provide an outstanding Vegan Menu, but with each bill, they add 99p to enable the planting of a fruit tree. These trees, planted in the developing world, will not only counterbalance the environmental impact of each diner’s meal but will also help to provide some of the planet’s poorest communities with a sustainable life. V-Rev Vegan Diner and their customers have planted tens of thousands of trees to date, resulting in countless lives been changed.